There has been little Katelyn Tuohy hasn't done, accomplished, absolutely crushed in the last year-plus. Cross country national title, indoor 5K national record, outdoor national mile record. Check, check and check. Lots of fast times, class records, course records, countless wins and, you know, breathless fandom from random strangers. That's all par for the course. But the North Rockland High School student-athlete, who's 16 and going into her junior year in 2018-2019, will get one more thing she likely never dreamed of. Katelyn Tuohy graces the cover of Sports Illustrated as one of two Gatorade High School Athlete of the Year. 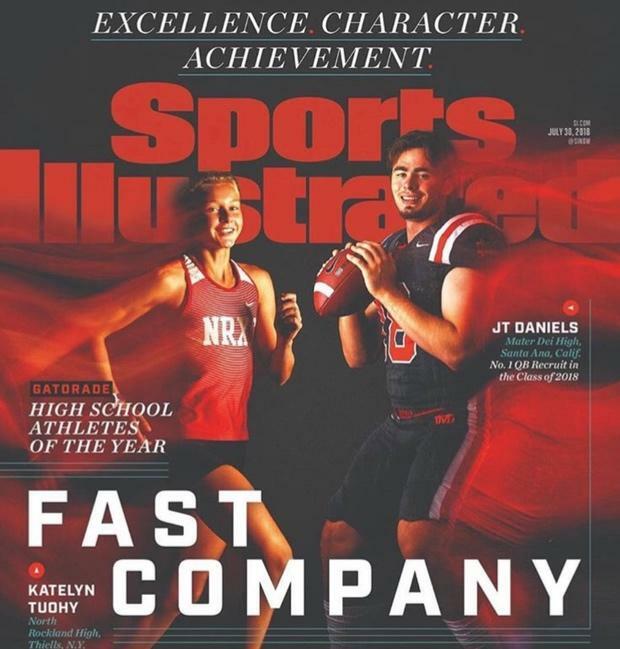 She's sharing the cover of Sports Illustrated with fellow Gatorade National Athlete of the Year JT Daniels, a quarterback for Mater Dei High School in Santa Ana, California, on July 30. On Tuesday, Tuohy was honored with 10 other national Gatorade Athlete of the Year winners at a special banquet in Los Angeles, California. She rubbed shoulders with professional athletes like Karl-Anthony Towns, Abby Wambach, Sydney McLaughlin and Sam Darnold. Talked shop. But now, finally, Tuohy can relax, decompress, and get back to what she does best: Focusing on the next season.